Make an impression with a professional autorun presentation on CD, DVD, USB ! 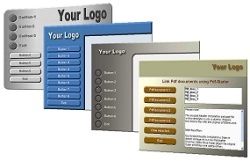 Set yourself apart from the competition with an attractive and clearly designed Autorun CD Menu. Download your free 30-day trial version and create your first CD Menu project. Why do you need a CD Menu / Frontend Menu ? CDMenuPro is a Windows software which lets you create a professional user interface (CD Menu) for your portable media (CD, DVD, USB stick). The CD Menu application provides buttons, menu bars, pop-up menus and selection boxes for starting your presentations, documents and programs. Placing no limits on creative freedom, this technique allows you to fully integrate your company's or product's Corporate Design. 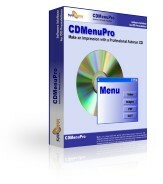 Why should you decide to use CDMenuPro to create your CD Menu / Frontend Menu ? Start today and create your first self-made CD Menu. A CD Menu has a graphic user interface and provides an interactive way for users to navigate computer programs. It makes it possible to choose and activate a particular action from a list of possible actions without having to know or use the exact command strings in text form or keyboard shortcuts. An autorun menu is a special kind of menu that is used for CD ROMs or DVD ROMs on computers running the Windows operating system. The autorun feature of the operating system is used to open a menu window automatically when a CD is inserted into the CD drive. A program for creating and editing CD menu applications. Autorun, autoplay and autostart are three different terms for the same function. When a CD is inserted into the CD ROM drive on a Windows Computer, a program is started automatically. A multi-media presentation is one of the most common uses. If the CD contains several presentations or documents, it makes good sense to start the CD with an autorun CD menu, which tells the user about the type and content of the CD and which can be used to start the presentations, documents and programs with the help of buttons.